The ghost of bowling's past is ready to make it's presence known! The Motiv Jackal is back in the form of a Ghost and is designed to be scary good on heavy oil lane conditions. This version has more total hook potential than it's predecessors as well as great continuation. The Jackal Ghost uses the Predator V2 core which features a low RG and high differential. The asymmetric core allows the bowler to easily product revolutions on this ball as well a large amount of track flare. When combined with the Coercion High Friction Solid (HFS) coverstock it takes the aggressiveness of this ball to the next level. The 3000 Grit LSS finish offers awesome mid-lane read and incredible continuation. Description: Ghost (noun): A combination of the Predator V2 core with the chemistry of the new Coercion High Friction Solid cover stock that delivers more total hook potential than any previous Jackal with no loss in continuation. The Coercion HFS is the most aggressive cover stock to date on a bowling ball in the Jackal product line. Turned with a 3000 Grit Lss Finish, bowlers will see both excellent mid-lane read and unbelievable continuation. I’m a fan of the Jackal Ghost for several reasons. I’m a fan of the cover, the core, and the ball reaction. Every Jackal created has always done as advertised and the Ghost is no exception, the Ghost will give you a lot of hook upfront and plenty of continuation down lane. I really like how early it is and how it allows me to instantly carve a pattern to my liking, I can sit in the oil shaping the pattern to what I want it to be and as friction increases I can either ball down or move left. The Jackal Ghost WILL force you left at box unless you chose to shine it up, because I love the snow tire effect it has in the oil I leave mine at box. In my bowling bag everything hooks less than the Ghost; the Jackal LE overall is 3 board less than the Ghost however it does provide a bigger shape down lane responding faster, and the Trident is about 4 board less overall and also responds faster down lane than the Ghost. The first layout I used on the Ghost was a low flare layout which allowed me to use the strength of the cover instead of the core, if I wanted more out of the Ghost it was a matter of adjusting the cover which I consider a benefit when using low flare layouts. Using the low flare layout I was able to play right longer and as the pattern started to break down it became a matter of adjusting my eyes rather than my feet, it was a predictable continuous reaction. The second layout I used in the Ghost was a bigger layout (50 x 4 ¾ x 60) which gave me an earlier/stronger reaction overall, I could easily open up the lanes with this reaction which I found favorable on longer and flatter patterns. Unlike the low flare layout I could really see the muscle of the core as the Ghost would make a heavy left turn, as I’ve stated before this is the strongest Jackal to date. There is nothing like a bowling ball that does as advertised and the Jackal Ghost indeed is everything it is marketed to be, you can haunt your opponent and defeat them at the same time and I promise you’ll enjoy it. Your game with thank you for it. Heroes get remembered, but Legends Never Die. The Jackal Ghost brings back the spirit of the original Jackal line using new technology to deliver the same performance. The Predator V2 core (2.47RG, .054Diff), wrapped in the all new Coercion HFS Solid coverstock (finished at 3000LSS), delivers the same continuation of the original Predator and hits the pit just as hard as well. I put the same layout on the Ghost as I did the original Jackal to give myself a good comparison and I have not been disappointed in the new versus the old. Since this new Coercion is much stronger I see the ball read the mids extremely strongly (I have come close to flaring the entire ball when I have to get on it) yet I see no hesitation when it comes to changing direction towards the pocket. So far I have found this to be an easy 3-2 to 5-3 more than my Trident of similar layout; both box finish. Though I get the best results when I am a bit more square, the ability of this ball to open up surprises me as I can swing it almost like it is a medium volume piece of equipment without the fear of it bleeding too much energy and finishing weak. What impresses me the most, though, is that the continuation is astounding. Once the Ghost decides to go left it just keeps going; a ball that cuts through heavier oils rarely flirts with leaving as many 9-pins as I have. Do note, however, that this is a heavy oil beast so I usually have to put it away by the end of game one in league (a medium oil shot at best). So long as you remember to stay in this hunter’s natural habit, enjoy unleashing this deadly beast that has risen from the dead, the Jackal Ghost. The Jackal Ghost, the newest Asymmetrical release from Motiv. I was excited to see the changes in the ball core/cover combo. As with this being an Asym, I had to make sure of the drilling to be able to get the most out of this ball. Given that I am rev dominant and have a lower tilt, I consulted with Jason Poli on choosing a layout. The lay out we came up with was 70 X 5' X 45. The hopes for the layout was to delay the start of the core and not have nearly as much flare. So the question is did all of the preparation work? The answer to the question is YES! As I drilled the Original Carnage, I drilled it stronger and had lots of hook stop motion and very little continuation through the pins. What I have found thus far with the Ghost is the opposite. The Ghost allows for me to use the ball in the puddle. I have been able to open up my angles through the front part of the lane and toss the ball to the spot. The Ghost doesn't over read the dry and when I use the shim to the left the larger pin to pap has allowed me the miss room left. With any strong Asym, the Ghost does need Oil. The benefit with the Asym core and this cover is it allows me to start a little deeper on the fresh and stay away from the traffic on heavier oiled patterns. So as this all goes, If someone is looking for a ball for heavy oil or a heavy puddle house pattern I would suggest trying the Ghost. The Core and Cover match really well, blending the lane out. The ghost will allow you to start inside the puddle toss it to the dry and maintain the continuation through the pins. The Ghost will have no issues telling you when it is time to transition away from it and place it in the bag as well. This is another wonderful piece in the long line from Motiv. For me the Jackal line has been very interesting. Some were very good and some not so good. My tilt and axis rotation is such that the ball pushes through the oil without much resistance so heavy oil was always something I struggled with. Over time I have learned how to stay more behind the ball and truly roll the ball which in turn help the ball to read more in the oil and has for the most part helped me to tame the heavier oil patterns. This is great with the exception that it takes me a bit away for my sweet spot and the comfort of just throwing it! I have been in search of a ball that would allow me to stay more up the side of it but still read for me in the oil. The Jackal Ghost became that ball. Because of its massive track flair, stronger back end and continuation the ghost allows me to stay within my game and feel confident that I can get in the oil and still control the pocket. This ball is idea for low rev or speed dominant players and will not disappoint. If you are looking for that heavy oil ball that will react where and when you need it to this is the ball for you! Hello guys! After quite some time we are back with another review, this time we had the chance to review the new Motiv release, the Jackal Ghost. 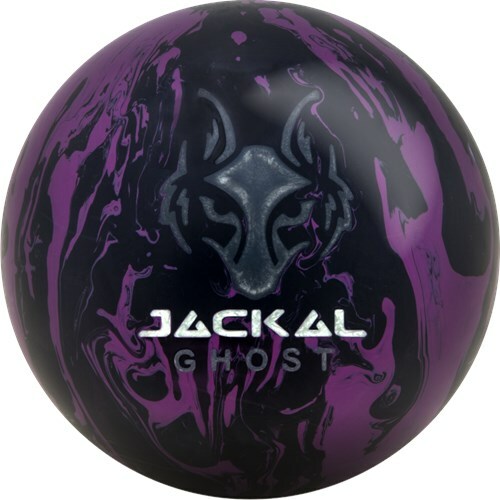 The Jackal Ghost is the new high performance ball in the Motiv lineup. It uses the assymetric Predator V2 core (a modified version of the original Predator core, and first used in the Jackal LE) and it is wrapped in the new Coercion HFS coverstock, the strongest coverstock ever used in the Jackal line. The Jackal Ghost is a beast. There is no other way to describe it. The ball reads strong in the mid-lane and has great continuation, something I've never seen on a strong solid asymmetrical before... I know it might sound like a cliche, but trust me, this ball is impressive. I've been using the Jackal Ghost for about two weeks now. The Ghost never quits. I was able to miss left a lot and the ball always recovered without rolling out or losing a lot of energy. Misses in goes through the head pin 90% of the time, so I was able to open up the lane and play angles I usually can't play on fresh because of my low rev rate. With the Ghost I am able to play inside 15 and the ball still comes back to the pocket, the farther I went I started leaving some corner pins, but I was impressed on how far from my confort zone I was playing. The Jackal Ghost is a great option for fresh oil and for heavy oil patterns. For strokers like me, with medium to low rev rate and medium to low speed, this ball will be money on almost anything. For tweeners and crankers I am sure it will be a great piece for heavy oil and flat patterns, where you need to control your breakpoint, because the Ghost, strong as it is, provides a lot of control. The Jackal Ghost is the perfect complement to the Trident. The Ghost is smoother, stronger overall and has a smoother backend motion than the Trident. The Trident is a tad weaker, cleaner and more angular down the lane. The Jackal Ghost reminded me of my beloved Forza on steroids. It has a similar motion but the Ghost is 10 times stronger than the Forza and has more continuation through the pins. For those looking for a heavy oil piece, I am sure you are gonna love this ball. I was a fan of the Carnage and the original Jackal, but this ball is way better than both. I am impressed on how much this ball hooks and how predictable it is. For the last two weeks in league, my lowest game has been a 210, and for an Average Joe like me (no pun intended) it is quite an achievement. If you have any question, advice or suggestion please let me know. I am trying to do my best with the reviews and any word would be truly appreciated. The Ghost Jackal has unbelievable continuation for a ball of its strength. The backend motion is very predictable. I noticed how much quicker I had to be in making adjustments due to how quickly the Ghost Jackal’s cover transitioned the middle of the lane. With the moves I had to make, the Ghost Jackal does not lose energy hitting the pins. The Ghost Jackal is an amazing piece. The cover plays a big role with this. For when lanes get tighter downlane, on flatter conditions, and when the fronts are flooded, the Ghost Jackal’s versatility will help combat any and all of those conditions. The backend shape is impressively predictable and controlled. This is one that always has a spot in my bag. The Jackal Ghost is a very clean ball through the front of the lane, with a strong, controlled motion all the way down the lane. I have not seen very many asymmetrical bowling balls that can continue through the pins like the Ghost can! Attacking the lane from multiple angles without losing a bit of energy is a quality that you will find in the MOTIV Jackal Ghost. This ball remains versatile no matter the condition it faces, from your typical house shot to the toughest of sport conditions, you can rely on the Jackal Ghost. From day one to now day 90, this bowling ball has not disappointed and remains a vital piece of both my league and tournament arsenal. Layout #2 places the pin at about the 2 o’clock position above the ring finger, creating a smooth, high flaring, strong and continuous motion down the lane. Using an 800-1000 grit surface, the Ghost digs into the lane a bit earlier and keeps the ball from jumping off the spot, helping the ball remain predictable as the lanes transition through league or tournament play. Layout #2 places the pin directly above the middle finger, creating a clean motion through the front of the lane, and an angular motion through the pins. The added MOTIV Power Gel Polish helps the Ghost skid through the front of the lane, without losing the angular motion towards the pocket as the lanes start to become difficult in the later league and tournament games. This layout and surface combination on the Jackal Ghost is a must-have as the lane transition requires the lanes to be played from deeper angles. I love my Jackal Ghost. It fits very well with my game, especially my speed and rev rate. I tend to need a stronger ball so I can't overpower it with my speed. The Jackal Ghost gives me a nice smooth and continuous reaction. The ball rarely overreacts for me. It is usually the first ball out of my bag and rarely gets put back in the bag during league. When the lanes start to break down I am able to move left with it and it will still make the turn to the pocket. Overall a great ball to add to any arsenal. I have been a bowler for the last 55yrs bought many balls in that time the only one i really thought suited my game was the Big Bang many yrs ago. About 9 weeks ago i was playing in a comp in Wigan UK and drawn to play with Peter Stevenson a new Motiv staffer for the 6 game qualifier. Peter really impressed me with his game tremendous amount of controlled revs he ended up winning the comp. We chatted away throughout the day as we played. During the last game he said i see you are using some Motiv balls, i said yes a couple of second hand ones i bought had them redrilled. He said i have watched you playing today and i'm not trying to sell you a ball but the one i think will suit your type of game is a Jackal Ghost. When i got home i checked it out on here and Utube and what bowlers thought of it. Well it did look good so i bought one and had the sheet strong drilling on it. I got it on the Saturday and without trying it i took it to a tournament the next day to play on the 44ft Big Ben amazingly i won the comp with an ave of 237 and won £300 so that was the ball paid for. Since then i have Ave 700 over the last 7 weeks at Wigan on a 41ft pattern. Two weeks ago i was in a International Senior tournament in Paris where i finished 4th Ave 218 over 23 and won 700Euros. Now back to the ball its amazing the way it rolls strong and the finish is just superb the last 3ft it moves so powerfully into the pocket and just carries everything. Its been a bit of a story here but i just had to make known just how good this ball is i am 73 and a stroker with not a lot of revs. This is the best ball by a distance i have ever had. Love this ball. Hits hard and always comes back. Only thing is it didn't last as long as I would have hoped. I had this ball since its release date and it was always the first out of the bag for me. I've had the oil extracted a couple times and had to throw some more surface on it as of late. Very solid backend with an early read. Works great with higher ball speed. Definitely the strongest ball in my arsenal. I have been able to use it on 41' + of oil without any trouble. In fact, at times it would be so strong that I would have to open my angles on what would normally be tight patterns. I have mine with the pin down because this is my first ball to go in Long patterns. Then, I could transition to my Venom Shock, Trident Quest, or the Villain depending on how the lanes are transitioning. Page created in 0.741 seconds with 22 queries.